The Northern Ireland Prison Service has confirmed that a prisoner has died in custody at Magilligan Prison in County Londonderry. 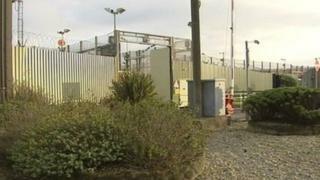 The Prison Service said the 44-year-old's next of kin has been informed. It happened in the early hours of Saturday morning. The Head of the Prison Service Ronnie Armour said: "I would like to extend my sympathy and that of the Northern Ireland Prison Service to the family of the prisoner who has died in Magilligan.